Today, in an email to the White House email list, President Obama announced his nominee for Librarian of Congress. Didn’t get the email? Sign up for updates. After a two week recess, the Senate has made significant progress in judicial confirmations on its first week back. This is not due to a drop in Republican obstruction, but instead to Majority Leader Harry Reid’s determination to overcome that obstruction. 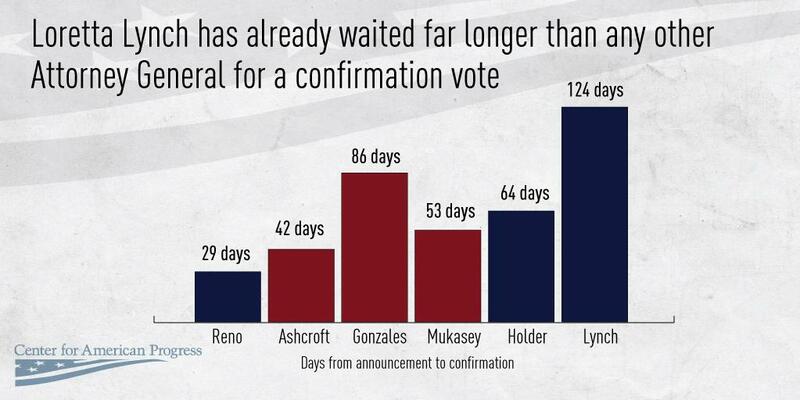 Only one week during President Obama’s administration has seen more judicial confirmations. Since Monday, over GOP filibuster efforts, the Senate has confirmed eight district court nominees and one circuit court nominee, while breaking the filibuster of a second circuit court nominee. Nancy L. Moritz’s nomination to the Tenth Circuit is scheduled for Monday, May 5. “This was a good week for our justice system, with nine judges confirmed to the bench. Americans saw critical advancement in confirming the circuit court nominees who have been denied a vote for months. A Ninth Circuit judge was confirmed, and the filibuster of a Tenth Circuit judge was broken. We applaud the Senate for moving forward on these confirmations, which are crucial for our justice system to run efficiently and serve everyday Americans. It is heartening to see the Senate taking this important step to strengthen our judiciary. “Senator Reid’s efforts to prioritize this issue and clear President Obama’s judicial nominations are making an impact. Despite Senate Republicans blocking nominees and delaying votes from the beginning, Senator Reid has pushed to move these nominations forward and this week, we’ve seen that work pay off. Although the term “nuclear opinion” was embraced by its opponents in an effort to cast aspersions it — its supporters have at times preferred to call it the “constitutional option” or the “Byrd option” — this maneuver is deeply rooted in the Senate’s history. As an article published by the conservative Federalist Society explained in 2004, the basic mechanism was devised by Republicans in 1890 to defeat a Democratic filibuster of a bill permitting military intervention in southern states that prevented African-Americans from voting. Under this 1890 plan, Sen. Nelson Aldrich (R-RI) proposed introducing a motion asserting that “[w]hen any bill, resolution, or other question shall have been under consideration for a considerable time, it shall be in order for any Senator to demand that debate thereon be closed.” Aldrich then envisioned a series of steps where the presiding officer of the Senate would reject the process proposed by his motion, and a simple majority of the Senate would reverse the presiding officer’s decision. Aldrich, however, never executed this plan because Democrats eventually caved and allowed a vote on the bill out of concerns that Aldrich would succeed. More recently, in 1977, Senate Majority Leader Robert Byrd (D-WV) successfully used a similar process to prevent senators from forcing debate on amendments introduced purely for the purpose of delay. Under this maneuver, Byrd asked Vice President Walter Mondale, who was then presiding over the Senate, to rule that he was required to “take the initiative” to rule such dilatory amendments out of order. When Mondale sustained Byrd’s request, supporters of more delay appealed that decision, and Byrd led the Senate to table this appeal by a majority vote. Thus, Byrd effectively eliminated a mechanism allowing a minority of senators to prevent a vote on a matter the majority supports, just as Reid seeks to do now. Indeed, in a memo provided to ThinkProgress, Sen. Jeff Merkley’s (D-OR) office identifies 17 additional times since Byrd originally executed this maneuver in 1977 when the Senate has changed its procedures by a majority vote. The most recent example occurred on October 6, 2011, when the Senate voted 51-48 that senators could not use “motions to suspend the rules in order to consider non-germane amendments post cloture” in order to delay a vote. Wasn’t There A Big Fight Over This During The Bush Administration? Yes. President George W. Bush nominated a number of unusually ideological judges to the federal appellate bench. As a Texas Supreme Court justice, for example, Judge Priscilla Owen took thousands of dollars worth of campaign donations from Enron, and then wrote an opinion reducing Enron’s taxes by $15 million. As Alabama’s Attorney General, Judge William Pryor defended handcuffing prisoners to a hitching post in the hot sun, and then making them remain there for up to seven hours with barely any water and no bathroom breaks. Judge Janice Rogers Brown compared liberalism to “slavery” and court decisions upholding the New Deal to a “socialist revolution.” Since joining the federal bench, she wrote an opinion suggesting that all labor, business or Wall Street regulation is constitutionally suspect. Democrats filibustered these nominees, and a handful of others. The Democrats’ filibusters did not last very long, however, in the so-called Gang of 14 agreement, seven Democrats agreed to a near total surrender to Republican demands — agreeing to permit Owen, Pryor and Brown to be confirmed to federal appeals courts. As an added bonus for Republicans, this agreement left the filibuster intact, thus allowing them to turn it against President Obama. But Wait, Didn’t Democrats Oppose The Nuclear Option In 2005? They did, but circumstances have changed quite a bit since then. Democrats filibustered nominees like Owen, Pryor and Brown because they viewed them as uniquely offensive nominees justifying the use of unusual tactics. Republicans under Obama, by contrast, say that there are some jobs that they will confirm no one to, no matter who President Obama nominates. Many Democrats who still believe that the filibuster can exist if it is only used, in the words of the Gang of 14 agreement, in “extraordinary circumstances,” now see that filibusters are being used in extraordinarily ordinary circumstances. They believe this is a bridge too far. there will be no one to enforce workers’ rights to join a union without intimidation from their employer. No one to enforce workers’ rights to join together to oppose abusive work conditions. And no one to make an employer actually bargain with a union. Without an NLRB to enforce the law, it may be possible for an employer to round up all of their pro-union workers, fire them, and then replace them with anti-union scabs who will immediately call a vote to decertify the union. Similarly, a Republican filibuster of Consumer Financial Protection Bureau Director Richard Cordary will likely shut down that agency’s new authority to regulate Wall Street. Anticipated filibusters of three nominees to the United States Court of Appeals for the District of Columbia Circuit will enable Republicans to strike numerous rules promulgated by the Obama Administration to protect workers, consumers and the environment. The filibuster is no longer being used to block unusually offensive nominees, it’s being used to hobble America’s ability to govern itself. Indeed, nearly 3 in 10 of all cloture motions filed in the history of the Senate were filed during McConnell’s reign as Minority Leader. In the past three years, Democrats twice agreed to minor rules changes that did little to quell McConnell’s tactics. This time, however, they appear likely to pursue meaningful reform. This shift is likely due to a pair of court decisions by Republican judges that created a looming crisis Senate Democrats can no longer ignore. The reason why the NLRB is in danger of going dark, stripping away much of American labor law in the process, are two decisions joined by five Republican judges that effectively strip away President Obama’s power to fill these seats via a recess appointment. And, while there is no guarantee that the Supreme Court will uphold these decisions, the fact remains that there are five Republicans on the Supreme Court and only four Democrats. If the NLRB goes dark, unscrupulous employers could do significant and irreversible damage to workers and the unions they rely upon to protect their livelihoods. Even if the Senate were eventually able to fill the open seats on the NLRB, the labor movement may never recover from the blow such employers could deal in the absence of an NLRB capable of enforcing federal law. Thus, the irony of the five Republican judges’ decisions stripping away much of the government’s ability to function is that it could ultimately have the opposite effect. Because Democrats no longer have the option to delay filibuster reform without risking permanent harms, robust reform is more likely today than it has ever been. And that will lead to a far more functional government than the one we have under Mitch McConnell’s preferred regime.